Breitbart News Executive Chairman and former White House Chief Strategist Steve Bannon launched into a tirade Saturday against “Republican scumbags,” such as GOP mega-donor Paul Singer, over alleged attacks on President Trump and Alabama Senate candidate Roy Moore. 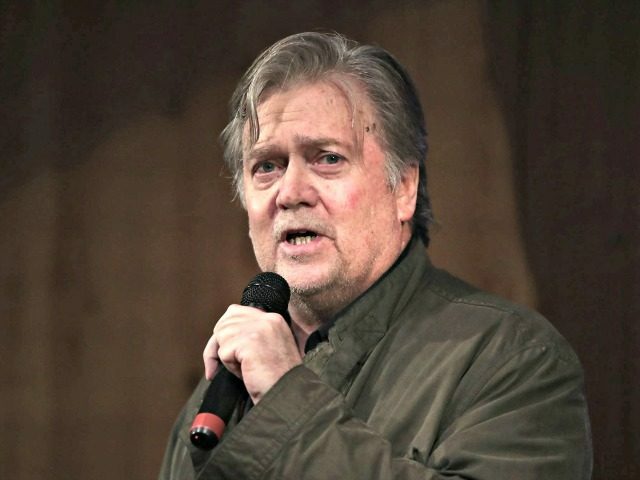 Bannon was referring to recent revelations that Singer was involved — via the Washington Free Beacon, which he finances — in funding Fusion GPS’ initial research into Donald Trump, which eventually led to the infamous “Trump dossier” — a collection unsubstantiated and sordid allegations claiming Trump was compromised by the Russians. Bannon was speaking just days after Roy Moore was hit with allegations of sexual impropriety in an in-depth investigation by the Washington Post. A number of Republican lawmakers quickly distanced themselves from Moore, with some calling for him to step aside from the race. Moore has denied some of the claims made in the Post article.